I like a room that can surprise and impress your guests. And the dining room is a great place to start as it's the room to socialize, to unwind, to share food, drinks and laughs with friends. So why not make it beautiful and interesting? These dining areas cater to the minimalist approach, embracing the starkness and richness of pairing dark fabrics and textures against a white backdrop. 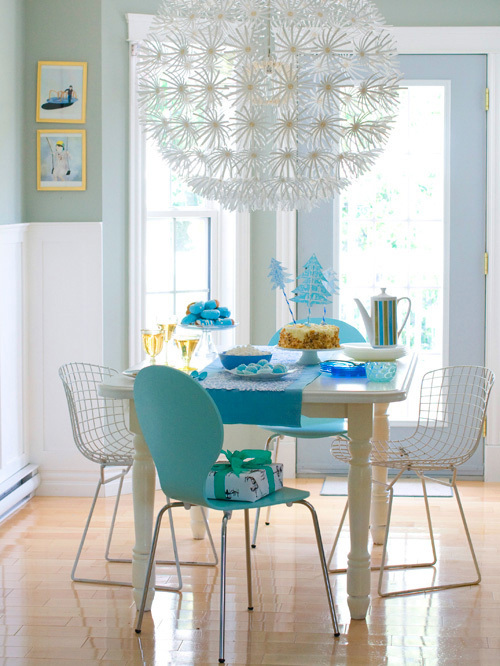 If you are lucky enough to have a lot of natural light, it's quite a lovely idea to play with color. The right combination of color, as pictured above, can immediately add warmth and vitality. I love stacks and rows of books, especially those within arm's reach of a dining table. But, what's not to love about this space- I'd kill for those windows, those walls, that height, that space...sigh.